TAR UC Faculty of Social Science, Arts and Humanities Dean, Mr. Lee Hwee Chuin, presenting a mock cheque of USD$1,001 (RM3,153) to WWF-Malaysia Youth Outreach Executive, Carmen Jang (far right). The students of Advanced Diploma in Public Relations, Tunku Abdul Rahman University College (TAR UC) collected 1,001 old mobile phones during a three-day “Connect2Conserve” event at the college’s KL main campus, garnering USD$1,001 (RM3,153) from Nokia Sustainability Division (SEAP) that was donated to WWF-Malaysia’s marine turtle conservation programme. 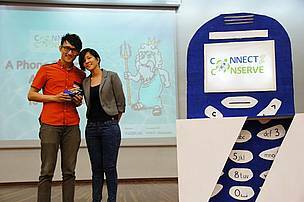 Nokia Sustainability Division (SEAP) had agreed to donate USD$1 (RM3.15) to WWF-Malaysia for every mobile phone recycled during the event held July 10–12. 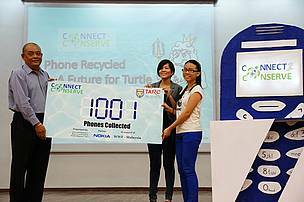 By combining phone recycling and the need to conserve endangered turtles, the event organizers also collected 3,711 pledges from students and staff to stop the sale and consumption of turtle parts and eggs, and to petition to the government to amend Malaysian policies to impose hollistic laws in protecting turtles. Ms. Suan Tan, WWF-Malaysia Senior Manager of Brand Activation, explained that marine turtles are threatened by the sale and consumption of their eggs, as well as pollution of the seas and nesting beaches, adding weight on the need to highlight marine-turtle conservation to youths through such events. 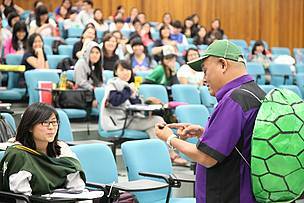 Commenting on TAR UC PR students’ third collaboration with Nokia, Mr. Lee Hwee Chuin, Faculty of Social Science, Arts and Humanities Dean commended the students for their hands-on practicality and social responsibility, breaking their previous record on phone collection. “This industry-linked campaign provides our students the opportunity to enhance their PR campaign skills, and as young Malaysians, to contribute to our society’s vital needs of preserving and saving the environment,” said YBhg Datuk Dr. Tan Chik Heok, TAR UC President. Mr. Francis Cheong, Nokia Senior Sustainability Manager, added that they will be rolling out many other recycling programmes with various organizations, government bodies and institutions in Malaysia. 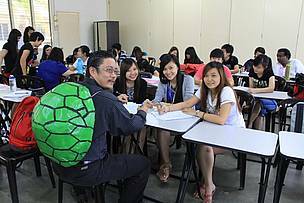 Mr. Lee Hwee Chuin living up to the challenge of wearing a turtle shell for a full day if the students achieved their target in collecting cellphones. Mr Chuan Tek Pheung, Public Relations Programme Leader, wore a turtle shell and taught for a whole day to support WWF-Malaysia’s sea-turtle conservation effort. Chee Weng Kiat (left), 23, recycled his old mobile phone at TAR UC PR students’ “Connect2Conserve” campaign and won a Nokia Lumia 820 through a lucky draw. 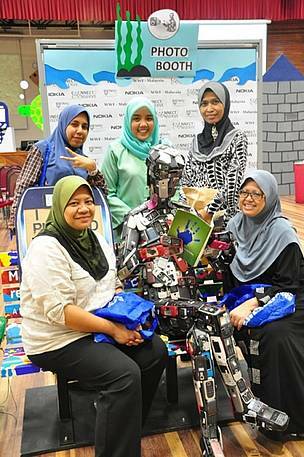 TAR UC staff recycled their phones and took picture with the Nokia Mobile Man, made of about 270 mobile phones, on a bench built of phone casings.